Every spring I like to plant as many flowers as we can afford. I like to have color in my yard. And while my back yard is pretty small, we like to make it look nice so that we can enjoy what we do have. The last couple of years, J has been wanting to help me in the yard. That's been fun but at sometimes it can be a little challenging. She wants to help weed and ends up pulling the wrong things up. Or she wants to pick the tomatoes before they are ready too. And if there's a bug on the plant she's watering, forget the watering, she wont even go near it until it's gone. I love that she wants to help me in the yard, but because of a few of these little challenges, I decided this year to let J have her own pots for flowers. This teaches her responsibility and it helps her learn about different plants. She gets to strengthen this little hobby of hers while she's learning. J is in charge of helping me water her pots. And instead of feeling like a chore to her, she loves it. 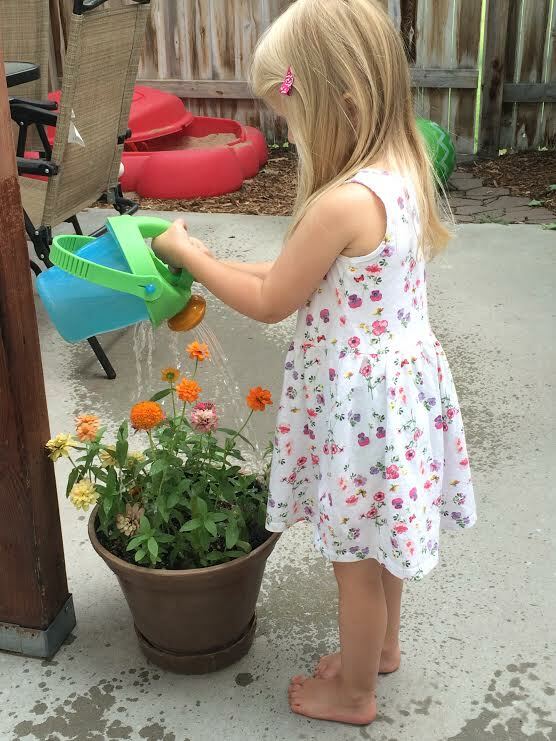 She asks if we can water the plants. We chose some easy plants to grow. Like these little Zinnias. They are a summer time flower. They do great in mostly sun and they are so fun and colorful. There are big Zinnias too but they do better in the ground, not a pot. Then she helps take care of some of my Hostas. These are great shade plants. They are mostly just green leafed plants and they can get pretty big. During the summer time, they get these little shoots with purple flowers on them. It adds a little color and it makes the yard look really healthy and pretty. 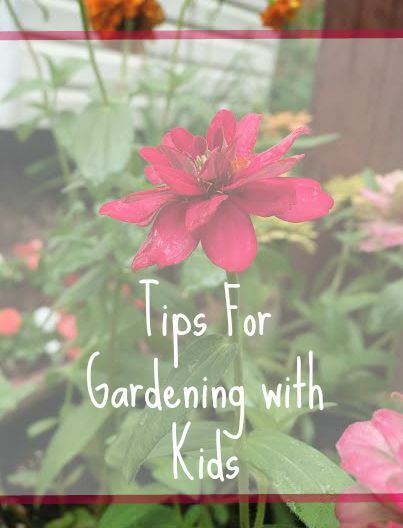 I thought it would be fun to share a few tips, and some ideas that I want to try out, for gardening with kids. First, putting plants in pots like these help a lot with kids. They help the kids know exactly what plants they are in charge of. The plants don't grow super big. And theres really limited weeding and other work. If you're wanting to do vegetables instead of flowers, some veggies do really great in pots as well. Tomatoes do good in pots as well as peppers. Herbs also do great in pots. Get them a little watering can. It's kind of hard for a little kid to aim a hose at the right plant. I honestly don't remember where we got this one that she's using, but here are some fun ones like it on Amazon. Start out with plants and not from seeds. It's really fun for them to see the seed become a plant and all, but it takes some time. And kids don't like to wait that long to see the progress. So by starting from a plant, they can see the growth faster and they are more excited about it. Show them how to do the work, and then let them do it. Obviously you're going to want to guide them and show them how things are done, but don't get carried away and hover over them. 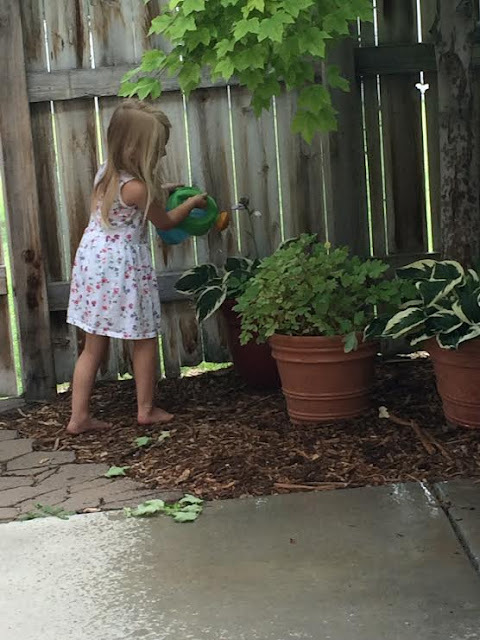 You can go back and check to make sure the plants are all watered good enough later, but it helps them feel independent, smart, and grown up if you let them water the plants on their own. Do you like to have a garden? I definitely want to start gardening more. I moved into my house 2 years ago and it was the first time I ever had outdoor space of my own (outside of when I lived with my parents). There are a bunch of fruit trees and berry bushes in the yard, but everything that grows there was planted by the previous owners. I need to start doing some things too! I'd love having a yard and room for fruit trees and berries! That sounds so fun. We have an apricot tree that only gave us one apricot this year. We had a late freeze right after all the blossoms came out. 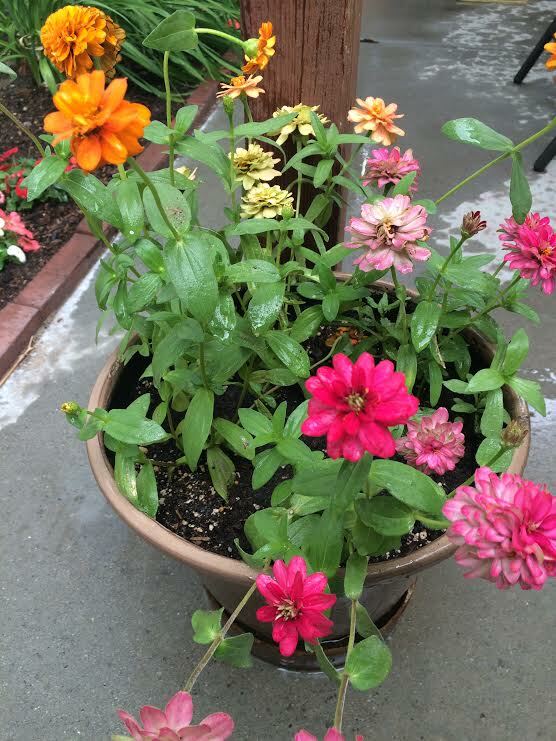 the best summer plants that I have are the Zinnias. This is such a sweet idea! I look forwarding to gardening one day with my future daughter. There's no doubt that your daughter is going to grow up with fond memories of playing in the garden with you! That's what I'm hoping for. I hated yard work growing up so I'm hoping to get to her and have her like it while she's young.